Come with me and you’ll be In a world of pure imagination Take a look and you’ll see Into your imagination. The best way to experience the Yarra Valley Chocolaterie and Ice Creamery is to become that child that is hiding within. If you were to ask me to recall a memory from my childhood that involved chocolate, I would describe a little munchkin half skipping, almost running down to the local Milk Bar with pocket money in hand to buy a bag full of chocolate buds. 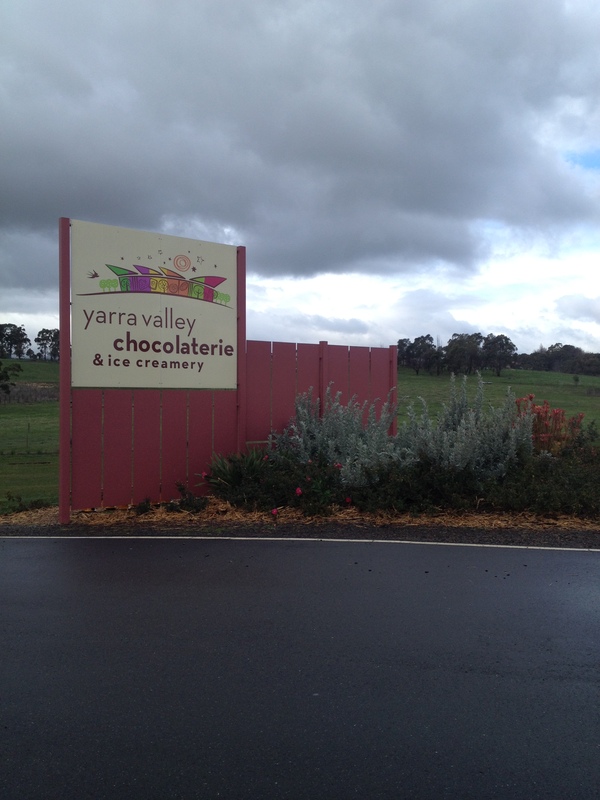 Every time I walk through the doors of the Yarra Valley Chocolaterie that little girl returns and with a skip and a jump (over my son) I dive into one, if not all, of the three bowls overflowing with complementary chocolate buds. Once I have pulled myself together and wiped my hands clean of my childhood memory, I make a B-line for the café. Walking straight past the ice-cream display, I stop myself from dipping my fingers in the spinning wheels of melted chocolate and head straight for the cash-register to order my usual – a serve of the chocolate brownies. Honestly, these are THE BEST brownies in my world, served with hand-made ice cream and a shot of warm melted chocolate – I would highly recommend you try them for yourself and tell me you don’t love them! Make your way to the front of the ‘store’ and press your face hard up against the viewing window to watch the Chocolatiers make the tasty chocolate creations available for you to buy. To me there is nothing better than experiencing life ‘through the eyes of a child’. Their joy and excitement is contagious and if you add chocolate to the mix you can expect some squeals of delight. So I highly recommend standing back and just watching the children as they try and compute what they are seeing – a world made entirely of chocolate, sugar and ice-cream. However you choose to spend your time at the “Chocolate Factory” it will be a visit that excites the senses. There is nothing but chocolate to see, smell, taste and even feel (check out the Chocolate Therapy skin care range). You will find it hard to walk away empty handed and you will definitely not walk away with an empty stomach.